Grooming your dog with clippers is not difficult once you take the time to understand what exactly you need to do. 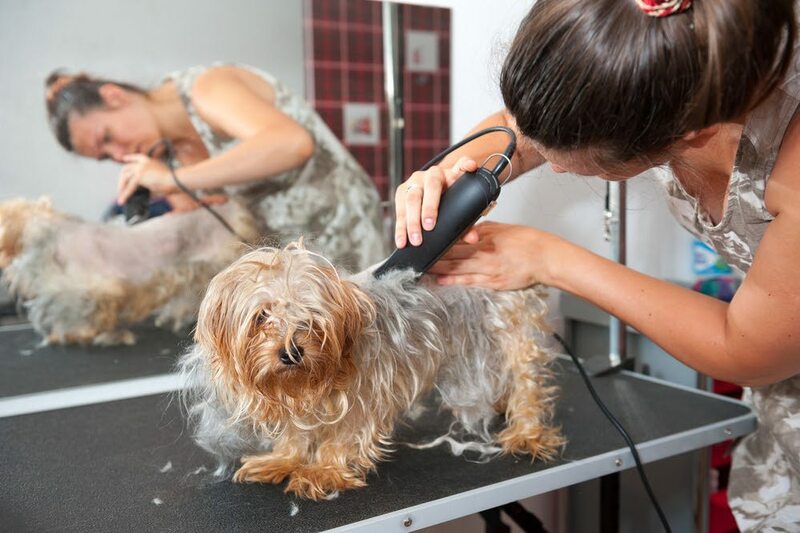 Depending on your dog’s breed, taking them to the groomer every time they need a haircut can prove to be a costly expense, so why not try to do it on your own? Most people opt for the groomers because they think they can’t groom their dog on their own, and they think they may harm their dog. Fortunately, grooming your dog can be a good bonding experience between the two of you! So grab a pair of clippers, a slicker brush,and a comb, and follow these helpful tips and tricks and you’ll be ready to groom your dog in no time! ​Before you even think about grooming your dog with clippers, you have to make sure you give your dog a bath and brush them before cutting their hair. Both a bath and brushing will help get rid of any tangle or clumps of hair that your dog may have in their coat. Tangles make grooming with clippers much more difficult and can even hurt your dog. ​It’s not much of a secret that your dog probably doesn’t do so well with loud noises. So take something that’s making loud noises and try to touch them with it, and it may not end so well. Luckily, there are plenty of clippers on the market that are quiet and won’t bother your dog as much. Make sure you test several different clippers and find the one that has an acceptable noise level for both you and your dog. ​If you’re pressed for time, don’t groom your dog. Grooming your dog should not be a rushed experience and you should set aside as much time as you need to groom your dog the right way. By pushing the clipper too fast along your dog, you will leave lines on your dog and it will look noticeably bad. ​Also, always make sure you’re moving the clipper in the right direction with the growth of your dog’s hair. If you clip in the right direction, you will leave a smooth and natural looking coat on your dog. If you clip against the growth of the hair, you will leave harsh lines. ​Before choosing to groom your dog on your own, it might be helpful to talk to a professional groomer. They can help walk you through the grooming process, and they will show you the best way to use the clippers based on your dog breed. The Super Mommy helped me with this part of the article. ​You can’t build a puzzle without knowing what the result is going to look like. Similarly, it’s going to be very difficult to groom your dog appropriately if you don’t know what your dog is supposed to look like when you’re finished. Of course, this doesn’t mean that you have to follow the look exactly, but searching for your dog’s breed club website should provide you with a good idea of what your dog should look like. And as a bonus, many of the breed club websites will offer you grooming tips for your specific breed! ​To effectively groom, you need to know what type of coat your dog has. Different blades will perform better with different coats, so if you know your dog’s coat, then you can effectively choose the right blade for grooming. ​As unfortunate as it is, many Clippers have the tendency to overheat after continuous usage in a short period. You should always make sure you’re checking the temperature of your clippers to make sure the blade is not too hot. Hot Clippers can burn your dog, so it’s important to monitor the temperature regularly. If you find that the clippers are too hot, you can try to spray on a coolant, switch to another clipper (if you have one), change out blades, or set the blade on something metal (the metal will absorb the heat from the Clippers). ​The earlier you start grooming your dog, the easier it’s going to be. Your dog will view grooming as a bonding experience, and once they get used to it, they will be more behaved, and it will help you avoid making a mistake or injuring your dog. ​It may seem a little overwhelming at first, but I promise that grooming your dog is not as bad as you may think it is! There are so many benefits behind it including bonding with your dog and saving money on grooming costs! Even if your dog is not a puppy, it doesn’t hurt to give grooming your dog a chance. The tips and tricks mentioned above will help provide you with all you need to effectively and efficiently groom your dog. Happy clipping!